I think this will definitely become an epic, all-time favorite series. It has everything set up for that perfectly: a big and well thought-out world, intriguing politics, interesting main characters, really inspiring friendships, a scary villain and even some romance. Everything that was set up in this first book in the series has me excited to continue on with the series because I am that convinced I will love it. But if I look at this book alone and don’t think about the huge possibilities of the next books still to come, I was just a little disappointed. Because as a first book, it just did not grab me and draw me into the book like I wanted it to. And this was the case for at least the first half of the book. Which is a long time. And this is weird, because you are thrust into the action from the very first page and no time is spent on info dumping, which I would normally applaud. But in this case I think the world of the Witchlands is so big and complex that without any information I was just confused for a long time. And unfortunately that affected my ability to enjoy this. That said, I did really enjoy the last part of the book, once I got into the world and was beginning to understand the different types of witches and the different empires and their power players. I liked that it’s not just as simple as two witches and one evil villain but that there are different empires and different politics in play. I really liked the focus of the book on the friendships, both between Safiya and Iseult as between Merik and Cullen. I liked the legends and am interested to see how Safiya and Iseult will factor into that. There is also some romance, but as with most of the book I liked it more near the end than in the beginning. Another thing I really appreciated was that we had the POV of our 4 main characters, as it really added an extra dimension to the book, though I did not like Aeduan’s POV in the beginning. Near the end he did grow on me – I think he’s a very intriguing, morally grey character who will have a very interesting character arc still to come and I am eager to read more of him. I loved Merik’s POV a lot and especially his interactions with Cullen. 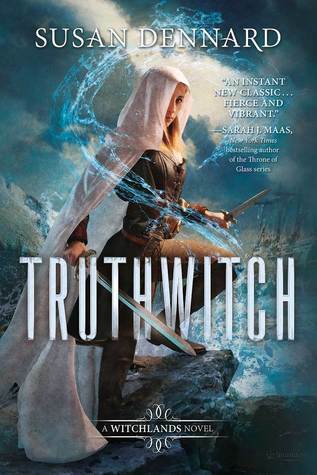 But my favorite POV was Iseult, she just seems to be the most interesting and I am looking forward to seeing how her connection with Aeduan will play out in the next books. Overall I would definitely still recommend this book to anyone who likes a nice fantasy book, but I would wait until at least the second book comes out so it can be binge read together. I think this book is ok as an introduction, but I feel the experience will be a lot better when the whole series can be read as whole. I know right? I loved Iseult the most! I wish there was more of her in the book.